CUSD #10 contracts its food service program with Sodexo USA, the leading provider of nutrition services to K-12 public schools in the United States. In addition to meal planning, storage, preparation and delivery of meals to the district’s schools, Sodexo also facilitates the processing of free and reduced meal applications for eligible students. The Collinsville district participates in the National School Lunch Program (NSLP) to allow eligible families the opportunity to apply for free or reduced breakfast and lunch. A student may qualify for free or reduced meals either through direct state certification or by parent/guardian completion of a household eligibility application. Direct State Certification – Households eligible for food stamps or Temporary Assistance for Needy Families (TANF) receive a child-specific letter in July of each year from the Illinois Department of Human Services. This letter is to be returned to the school the child attends in order for the child to receive free meal benefits. If this “direct certification” letter is submitted to the school, the parent/guardian DOES NOT need to complete the Application for Illinois Free Lunch and Breakfast. Household Eligibility Application – Households that do not meet the criteria for direct certification may apply for free or reduced meals by completing the Application for Illinois Free Lunch and Breakfast form (found in the PDF Library to the right). Completed applications should be sent to the school office or the Sodexo Food Service office (2201 South Morrison, Collinsville, IL 62234). The Sodexo office staff will process the application and notify the parent/guardian of the meal status decision (free, reduced or denied). Students cannot receive free or reduced meals until the parent or guardian has submitted an application. The parent/guardian must reapply for free or reduced meals annually. 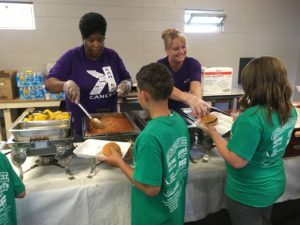 Students receiving free or reduced meals at the end of a school year will be given 30 days at the beginning of the next school year to submit a new application. If an application is not received by the end of the 30-day period at the beginning of the school year, a student’s status will automatically change from free or reduced to denied. Students attending the district’s K-4 elementary schools may pay cash daily for meals or purchase a block of meals on a meal ticket. If a student does not have a prepaid meal ticket, he/she may pay cash at the cashier’s station or may give meal money to his/her teacher at the beginning of the school day for safe keeping. Meal tickets may be purchased for up to 20 meals at a time. Parents/guardians may obtain pre-printed envelopes from the school office for meal tickets. Parents/guardians deposit meal money (or a check made payable to Collinsville CUSD10) in the envelope and complete information on the outside of the envelope, including the student’s name, teacher’s name, and number of meals being purchased. The student gives the sealed envelope to his/her classroom teacher. The teacher then sends these envelopes to the school office and the office secretary forwards the envelopes to the Sodexo cafeteria staff. A Sodexo staff member prepares a personal meal ticket for the student. The meal tickets are maintained by the school office and are delivered each day to the classroom by support staff. Students present their meal tickets to the cashier in line. The cashier makes a mark on the card indicating the use of a meal and keeps the cards to be distributed and used again the following day. If all meals are used up on the meal ticket, a blank meal ticket envelope will be provided to the student to take home. Students attending DIS, CMS and CHS use the Cafe Enterprise point of sale card (debit) system. The point of sale system allows a parent/guardian to pay in advance for meals and/or a la carte foods (juice drinks, ice cream, cookies, etc.) Students are still able to pay cash on a daily basis if they choose. The system works with a 12-key PIN pad (located near the end of the serving line) that is similar to an automated teller machine (ATM). The pad allows each student to enter their 6-digit personal identification number (PIN) to access their account. The student’s PIN number is unique and should be memorized. The system is very confidential. All students will be required to enter their PIN number regardless of meal status or payment method, thus insuring every child’s privacy. All students will have an established debit account, although they will not be required to make advanced payments because the system has the ability to act as a cash register and can accept cash payments on a daily basis. However, for a parent/guardian’s convenience, the three options are available for making advanced payments (see below). To prevent fraudulent use of student accounts, student photos are loaded into the system. These digital images appear on the monitor for the cashier to view every time a child accesses his or her account, therefore insuring that no other student can use another child’s account. Money is deducted when the student uses the account to purchase meals and/or a la carte items. The system knows the meal status of each student (full-pay, free, or reduced) and will deduct the correct amount from the account. There is no limit on the amount of money that can be deposited into a debit account. When account balances fall below $5, the cashier will remind the student that additional money should be deposited or brought to school to continue purchasing meals and/or a la carte items. A payment form is available in the PDF Library (above). Once completed and printed, this form should be returned with each deposit. For safety purposes, we recommend that advanced payments be sent in the form of a check. Checks should be made payable to Collinsville CUSD10. If a payment is sent for more than one student in the same school, an indication of the amount of money to be deposited for each student should be made on the form. If an amount is not specified, the deposit amount will be divided equally between siblings’ accounts. If a payment option is not specified, all monies will be deposited under OPTION PLAN #1 – Cash On Account. OPTION #1: CASH ON ACCOUNT — A cash debit account is created by making a payment of a certain dollar amount ($5.00, $10.00, $20.00, etc) to the cafeteria. These funds are then deposited into the student’s debit account and are available when the student purchases meals and/or a la carte foods in the cafeteria. There are no limitations as to what may be purchased or how many purchases can be made. The account balance simply decreases as purchases take place. OPTION #2: PREPAID MEALS ONLY — Monies put on account can be designated for student meals only. No snacks or a la carte food items can be purchased with this payment. Students would need to pay cash for any snack or a la carte items being purchased. To calculate, determine the number of meals to purchase and then multiply by the price of the meal. Meal prices are listed above. Any number of meals may be purchased at one time. OPTION #3: BOTH: PREPAID MEALS AND CASH ON ACCOUNT – Parents/guardians may purchase Prepaid Meals and put “cash on account”. This option ensures that the student receives a lunch and allows him or her to purchase a la carte foods as well. However, there are no limitations as to what foods may be purchased a la carte, or how many a la carte purchases can be made. When making a payment for both, it is necessary for the parent/guardian to state clearly how much money is for prepaid meals and how much is for “cash on account”.